I joined Godalming Angling Society at Sumners Match Lake near Horsham today. Twenty anglers arrived to quite a cold and windy day. 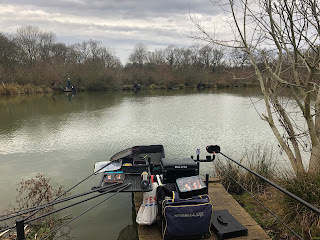 Today's match counted both carp and silvers however there was also a silvers pool, draw depend would shape my day, I aslo wanted to use the day as further silvers practise for Ricky Baxters Silvers League. Permanent Peg 4 in the bowl was my chosen peg for the day, which was also the end peg. I'd fished the bowl previously so I was definitely starting to think that my carp match was not going to happen. I grabbed a feeder rod that was setup with a modified method feeder and some pole elastic to carry a PVA bag of pellets and a white wafter for the carp. 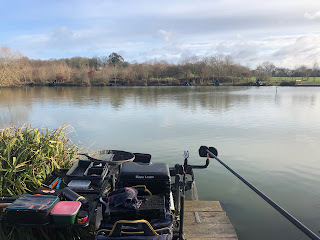 3 metre whip12 metre line5 metre margin line Bait was very simple, casters, maggots together with some groundbait just in case the carp or even larger skimmers moved in. Rick Baxter announced a three match silvers series at Sumners Match Lake spread across January, February and March. With a great bunch of lads and just down the road it was too good to resist particularly as it would make great practise and preparation for Stafford Moor silvers at the end of Feb. Temporary peg 20, the first peg on the right hand side from the car park, right next to the "wedding platform". 3 metre whip6 metre pole lines to my right and into the margin Bait was very simple, maggots, casters and a small amount of worm. No ground bait mixed at all. The plan was to exploit the whip line for the first hour and then to strategically take silvers from the margin and 6 metre lines. It didn't quite work that way.